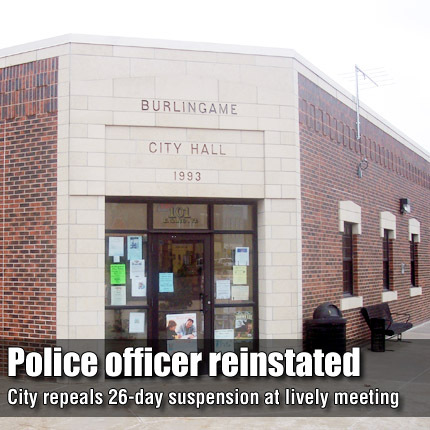 BURLINGAME—A Burlingame police officer suspended for more than three weeks was reinstated by the Burlingame City Council Monday evening. The council meeting room had standing room only during the first hour of the July 18 council meeting. To provide an opportunity for members of the audience to address the council, Burlingame Mayor Ray Hovestadt reminded speakers to limit comments to three minutes each. The council convened one executive session during the meeting to protect privacy of personnel. Upon return to open session, the council adopted a motion by Burlingame City Council Member James Nelson to reinstate officer Edward Dudley immediately. No reason was given publicly for Dudley’s suspension. Dudley had been the second Burlingame officer suspended in about a month’s time. The council suspended officer Anthony Richman without pay during a May 20 special meeting. The next day, Richman was arrested on numerous charges of theft, some of which alleged he obtained gasoline from the Burlingame Coop using a city-owned charge card. A credit card audit later submitted to the council by auditor Stephen Connelly indicated Dudley said he had also used the card on one occasion. Dudley has since told The Herald-Chronicle he used the credit card once when he was unable to obtain gas at local convenience store because it was closed, and he needed gasoline to get home. Dudley told the newspaper the purchase was authorized by Burlingame Police Chief Jon Shaffer, and he placed cash and the gas receipt on Shaffer’s desk that night. During Monday’s meeting, former mayor Brenda Dorr questioned if Dudley was to receive back pay for the 26-day suspension. Nelson, who had made the motion to suspend Dudley on June 22, replied that he would not.